Sicilian Guiseppe Aiello came from Bagheria di Palermo as did many of his brothers and cousins before him and after.The Aiellos formed a huge family. Many settling in New York and others migrating to Chicago. Andrea "Andrew" Aiello (arrived March 18,1906) and was one of the first to come to the U.S.A. He first settled in Utica, N.Y. (Also where he recieved his famous brother Joe). 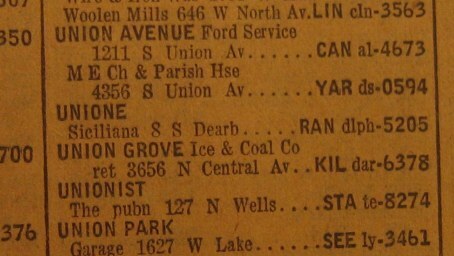 He was the welcoming son to his newly arrived father Carlo Sr. 62 who arrived on August 22 1920 (received by son Andrew at 224 Locust street Chicago) and brother Carlo Jr.( arrived January 17,1921 and who in turn was received by his dad who was at the time living in Chicago at 224 Locust street with Andrew. The soon to be leader of the Aiellos, Guiseppe (Joe) Aiello arrived at Ellis island after his brother Andrew. July 27,1907 on the ship called "Cretic" His ethnicity was described as Southern Italian. He was 17 years old and single upon arrival. He met up with his brother in New York. 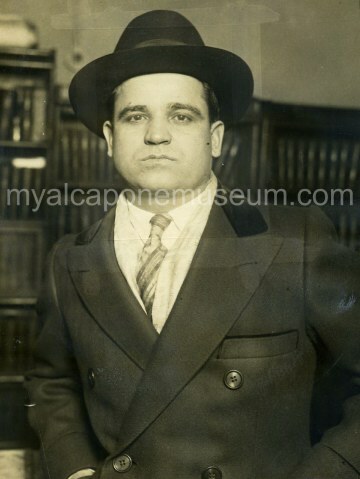 In Chicago the Aiello's went into business opening a Grocery importing company.This company imported Olive oil,Cheeses, and a very lucrative commodity that was about to thrust them into Chicago's gangland world. Sugar was used in alcohol fabrication. The Aiellos supplied it en masse to any gangs distilling alcohol. They made their fortune with it. At the time the Genna brothers who ruled little Sicily with an iron fist were the kings of distilling rotgut spirits. They sometimes used other less than kosher materials. After the decimation of the Gennas the Aiellos came to be the ruling family of Little Sicily in Chicago. The family opened a bakery called Pasticceria Bella Palermo situated at 473 West division street. Another business run by the Aiellos was a confectionary shop called Aiello and Aliotto at 516 Oak street. Aiello was good friends with a fellow countryman by the name of Antonio Lombardo. At the time a benevolant society by the name of the Unione Sicilana was set up to help any Sicilian newcomers to the city and America. 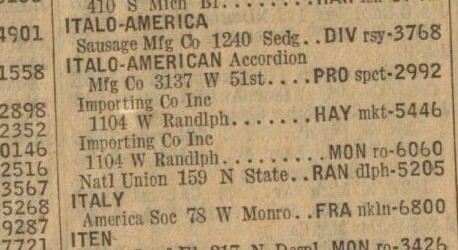 (Unione Siciliana phone listing circa 1923). It didn't take long for corruption to set in and the Unione became sort of an extortion praying on it's own people to pay tribute and the profits collected were used for criminal enterprises. If a fellow sicilian mobster was in trouble and legal funds were needed it wasn't uncommon at the time to be paid a visit by a few characters demanding that you help kick in some $$$ for the effort. A reply of no was not soon forgotten and was usually met with retribution. This organization is not to be confused with the Sicilian Mafia in Sicily. The Unione was a local Chicago Sicilian benevolant society which quickly was used as a means by the local black handers or gangsters to extort money from Sicilian members. (Quick money). Many sicilians vied for the throne of being the head of the Sicilian Unione. Why? Many wonder as many who had occupied it were not breathing for very long. Mike Merlo sort of the honest abe of all Unione leaders kept the peace and was loved by all his countrymen. After his death from cancer other leaders followed. Samoots Amatuna who was not on the throne long enough for it to get warm was shot in a barber's chair. He lingered for a day or two before succumbing to his wounds. Aiello's friend and countryman Antonino Lombardo attains the Unione throne much to his other friend's joy. His other friend is none other than Al Capone. Al Capone cannot hold the position himself due to the fact that he was not Sicilian. He was Neapolitan and It was not the Unione Neapolitan but in fact the Unione Siciliane. So Sicilian is a prerequisite for the job. By having his Sicilian choice at the top Capone receives certain favors and his business dealings also become more profitable. A sort of bigger pull. Crowd gathered outside Michele Merlo's home for his funeral. 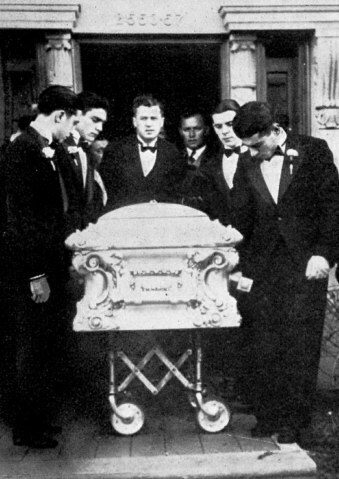 Merlo's casket being carried by his Sicilian brethren. Note Pasqualino Lolordo is third on the left and Joe Giunta front second on right side. Joe Aiello and Tony Lombardo are also business partners in an importing company called the Antonio Lombardo & Co. Aiello is president and Lombardo is Vice President. 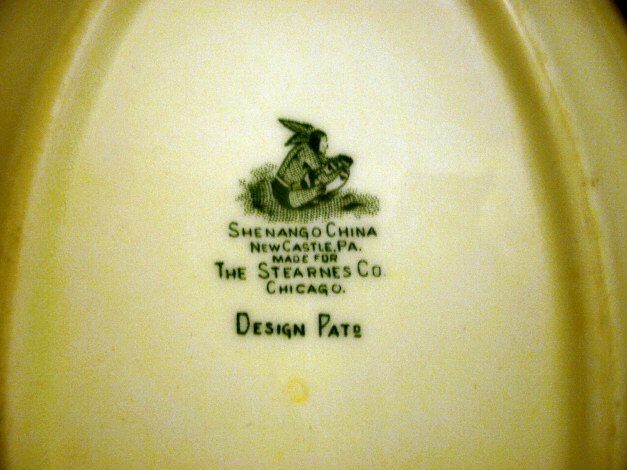 This business was started with a $100,000 loan from Al Capone. The business was a profitable one, but Aiello's greed led him to want it all. He wanted to be the envy of his fellow countrymen here and in Palermo. Aiello and Lombardo started quarrelling. This led to the eventual break up of the business partnership. Aiello begins to be arrogant. Hiring killers to get Lombardo or Capone. Paying hitmen and cooks to poison food served to Al or Lombardo. All plots are uncovered and quashed. Gun nests tied to Aiello are found across the street from Lombardo's home and another across from Al's favorite cigar store. While being in police custody on November 1927, Aiello is in the station when a band of Capone gangsters stop in front of the station to taunt police waving their guns.This is done on purpose to get arrested.They are placed in a cell next to Aiello. Aiello pleads with the Capone gangsters to let him sell his businesses and houses and he will leave for good in fifteen days.He begs them to think of his wife and child. In Sicilian they tell him "You started this you dirty rat!" We're going to finish it.Your as good as dead!" A police man who knew sicilian heard the whole conversation. 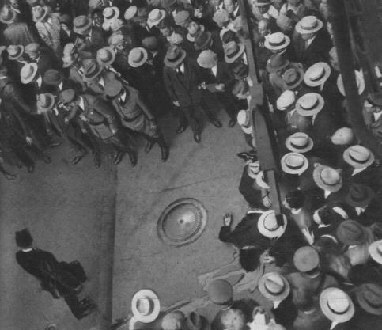 Frank Perry (Beige), Just one of the Capone gangsters causing a raucus in front of the police station in order to get at Aiello who was detained. Louie Campagna gets arrested and is placed near Aiello in an adjacent cell. Aiello leaves the station under police protection, but somehow the allure of power still doesn't get the scared Aiello out of the business. Even by the mighty Capone gunsels. His 2533 Lunt home whom Aiello shared with his brother Dominick was furnished in grand opulance with fancy oriental rugs, expensive paintings and new modern furniture.This reflected his mounting stature in the Sicilian community. To help him over the top and achieve his goal of supreme Sicilian boss, Aiello was going to need some help from previous rivals. He formed an unholy alliance with George "Bugs" Moran and his Northside crew. Both filled the void of their respective aspirations. Aiello the Unione throne and Moran ruling the Northside with a power in the Siclian Union. They needed to exterminate the ruling union leader to have chance at the position. Aiello was also good friends with a certain Frank Uale from New York who had a say in Unione dealings around the country. 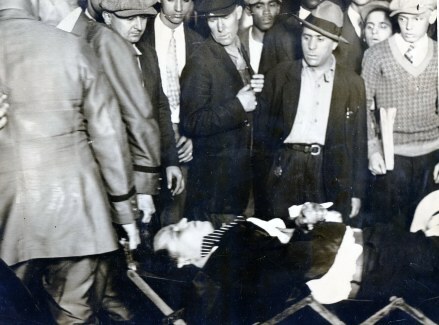 Uale is killed in New York on July 1,1928, by Capone gunsels who find out he is stealing Capone booze shipments and may be backing Capone's rivals in burning and attacking Capone's dog tracks. Back in Chicago the plan was set into action to rid the world of Tony Lombardo. 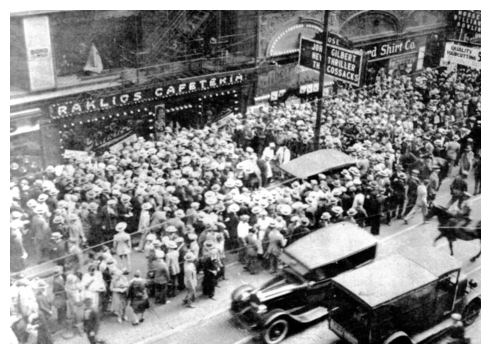 On Sept 7,1928, Tony Lombardo and body guards Joseph Ferraro and Joe LoLordo are walking together when they reach a crowded Madison and Dearborn streets when shots suddenly ring out. 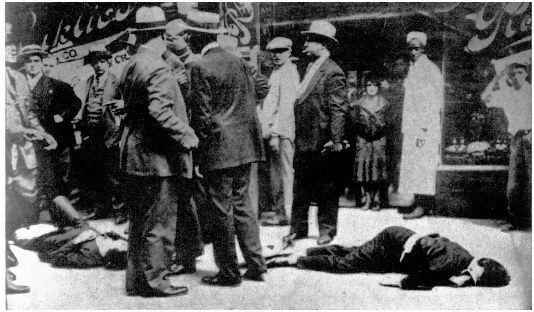 Lombardo is killed and Ferraro is mortally wounded. He later succumbs in hospital. LoLordo tries to run after the killers, but is arrested. Some claim LoLordo is in on it .This is due to the fact that he is not killed and is related to Pasqualino LoLordo also a friend of Joe Aiello. Crowds quickly gather after Lombardo and bodyguard are shot down in broad daylight in front of Raklios restaurant. Joseph LoLordo, Lombardo bodyguard and brother to Pasqualino LoLordo. 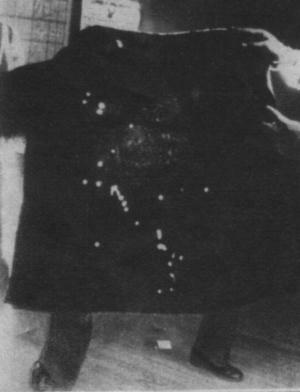 Joe was a suspect in the St. Valentine's day massacre. 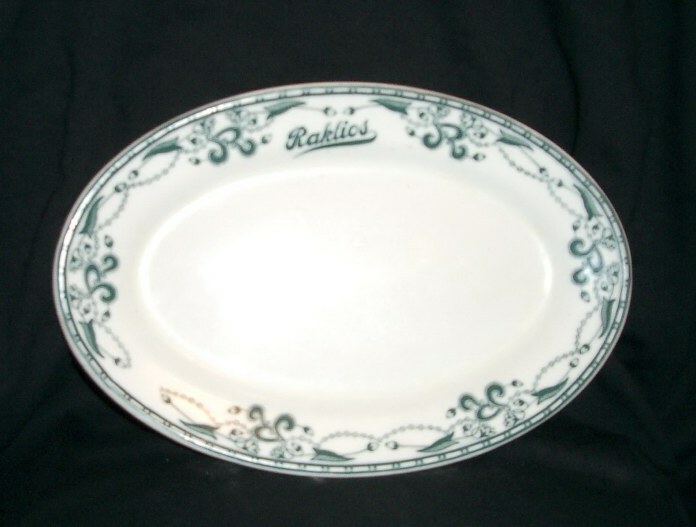 Plate from Raklios restaurant. Who knows what famous gangster ate from this. Top view of Lombardo laying dead on the street. Tony Lombardo lay dying amongst a crowd in front of Raklios restaurant (right). His bodyguard Joseph Ferraro (Joseph Morici) is at the left. 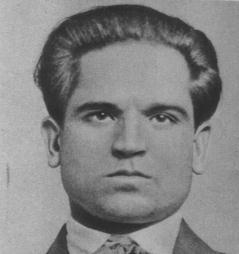 Capone's chosen Unione Siciliana man. Antonino Lombardo aspired to a seat that became frequently empty once the leader was disposed off by quick death. Michael Merlo was the only one previous to go of natural causes. At the funeral, a grief stricken Mrs. Lombardo. The killers are thought to be Moran hitmen Pete Gusenberg, Frank Gusenberg and James Clark. Aiello assumes he will now have a chance at the throne. 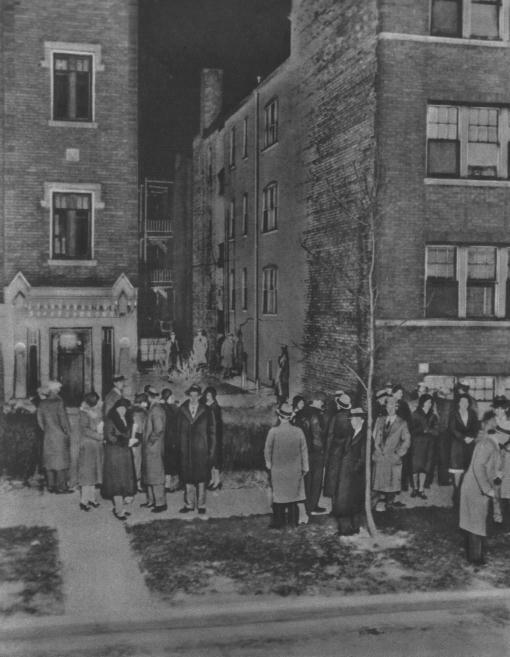 A supposed meeting for the choosing of the new president was to be in a Cleveland hotel where major Chicago sicilian gangsters were gathered for this purpose.It is said that Aiello who was supposed to attend this meeting, but instead notified the police there and had all the gangsters arrested.Aiello's plan backfires. Pasqualino LoLordo is now the chosen through his Italian citizen's club as the one to replace Lombardo. LoLordo is also a friend of Capone. Aiello is livid. Capone doesn't forgive Aiello's past indiscretions by sending out of town killers to get Capone. And especially trying to poison his food. Aiello's bakery was repaid and raked by Capone gunmen toting machineguns. 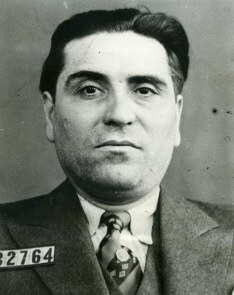 Pasqualino LoLordo's police mug shot. Aiello thinks fast and arranges a meeting with LoLordo. Aiello is seen a near the LoLordo home for about a week. Aiello lets it be known to LoLordo that he wants peace and just wants to do good business. This is speculative, but it could have been very possible that LoLordo arranged to have a meeting between LoLordo and the Northsider to arrange a peace talk. LoLordo might have accepted thinking he would single handedly pull off this truce. LoLordo was also known to have been running a big distillery in the Northside.This is something that might have not been making Moran too pleased. 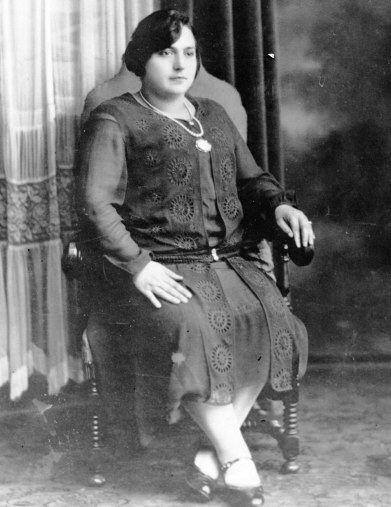 Mrs. LoLordo, who found her husband dead in the parlor. January 8,1929, Pat LoLordo welcomes three callers. They stand around in the parlor and give toasts to each other raising their wine and whiskey filled glasses. All of a sudden shots are fired and LoLordo falls to the ground. His head placed on a pillow. His wife comes in screaming as the three men quietly leave. The black maid assures police that the men who with LoLordo were not Italian. Pete Gusenberg, Frank Gusenberg and James Clark again come to mind. Aiello could have told LoLordo to expect them and that he would arrive later. In a criminal clean up, the Unione Siciliana later becomes the Italo American National Union. It's still infiltrated by Chicago outfit even after the Capone era. LoLordo laying on a pillow dead after entertaining guests. Capone has had enough. The St. Valentine Massacre sort of gets back at the Lombardo and LoLordo murders and puts a temporary hold on Moran's career.Aiello loses a big part of his muscle in Moran's boys. Aiello leaves town fearing his life. 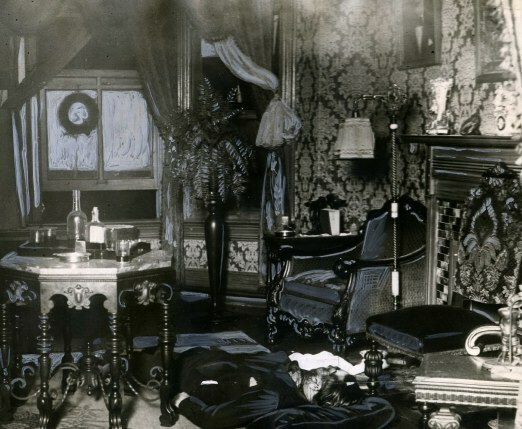 After the Atlantic city conference in which all past grievences between warring factions are absolved Aiello figures he can come back to Chicago as a business man.He also realizes that the throne to the Unione Siciliana is vacant as the man who held the position, Guiseppe Giunta, is now dead for trying to take over Capone. Aiello broke three rules that led to his death. The Capone mob took him down because 1) His participation in deaths of Unione Sicilana's presidents. 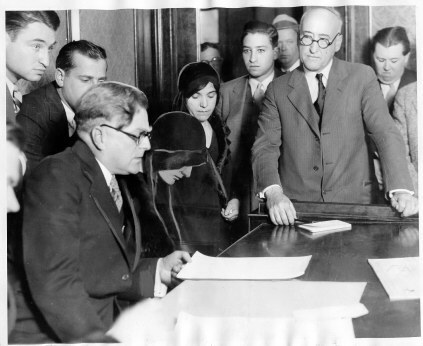 2) Breaking the agreement made at the 1929 Atlantic City meeting of promising not to open any new race tracks in Chicago. 3) Being part of the gang that killed reporter Jake Lingle. For a little while life continues for Joe Aiello, but he is living on borrowed time. He should have left as promised in 1927. Many nights he sleeps in the attic of his Lunt Avenue home were he has set up a mattress. He is fearing police or Capone gunsels. On July 23,1930, an Aiello gunman by the name of Peter "Ashcan" Inserio is shot at his soda fountain. 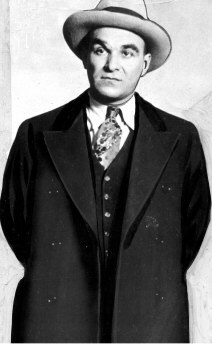 On September 13,1930, Aiello bodyguard Jack Costa is shot and killed. Aiello hides out at his henchman's appartment at 205 Kolmar avenue. 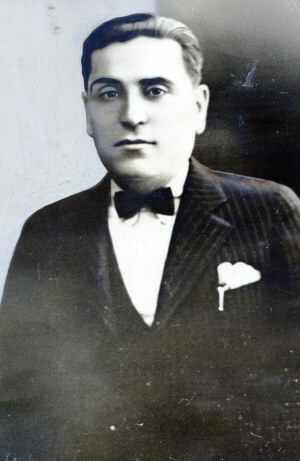 His henchman Pasquale "Presto" Prestogiacomo was also in business with Aiello in a venture called Italo American importing company in which Presto was treasurer and manager. Aiello was hiding and waiting to get in a cab to leave the city as he knew the squeeze to get him was on. He had no idea what was about to befall him outside. Not one, but two machine gun nests were waiting. (There was even supposed third gun nest).This was a certified trademark of the Caponenites. As Aiello exited 205 North Kolmar, a machine gun opened up from a window at 202 North Kolmar. As the firing began he ran left towards the rear of the 205 Kolmar building. 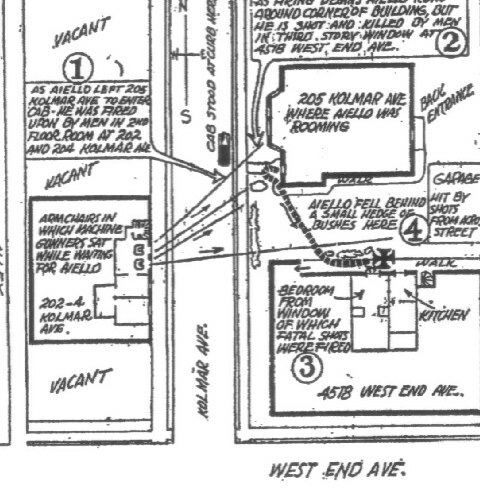 In the back next to the Kolmar building lay another machinegun that opened up on Aiello from a window at 4518 West end avenue.Aiello had no chance in hell.Lead bullets poured into him and he dropped dead in a brush against the building containing the second gun nest. He had something like 40 to 50 bullets that penetrated his body. 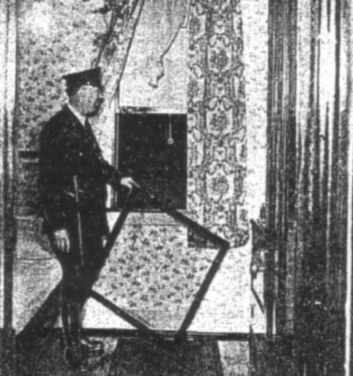 The Capone gangsters even went as far as disabling the outside buzzers to all the appartments in order to avoid Aiello from entering back when the bullets started to rain on him. 205 North Kolmar.Crowd gathers after Joe's body was removed. The building still exists today and has newly been renovated. First gun nest at 202 North Kolmar. Second gun nest at 4518 West end avenue. 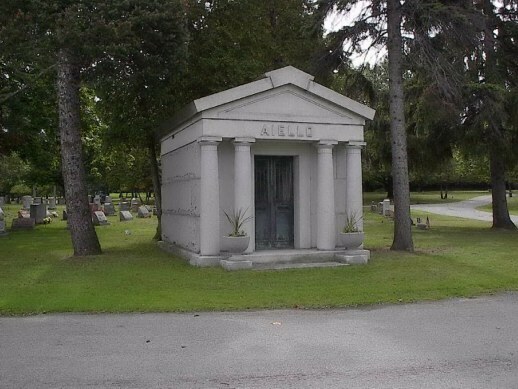 Before eventually being placed in Rochester, New York's Riverside cemetary, Joe Aiello was originally buried in Mt. Carmel cemetary in Chicago on Oct. 29,1930. He was buried close to Tony Lombardo at the time. His funeral was lacking the show up of gangsters. Even his brothers and many cousins failed to show at the gig. 12 year old Carl comforting his mother Catherine Aiello after she learns of her husband's demise. October 28,1930. Coroner Herman Bundesen is in charge over the inquest into the death of Joe Aiello. Aiello's distraught wife is beside Bundesen being questioned. 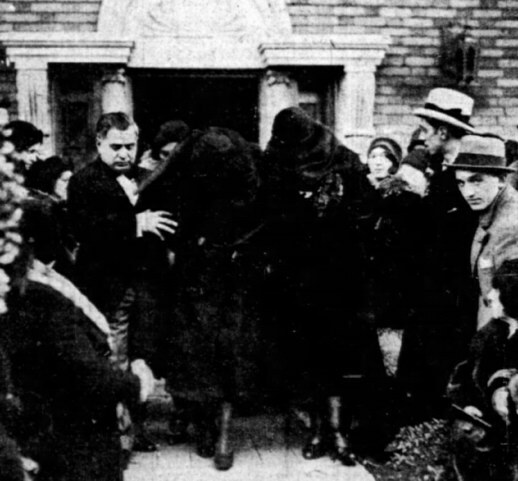 Joe Aiello's ornate coffin being led out of the Aiello family home. Undertaker and Aiello gang member Peter J. Maruca (Left) escorting Joe Aiello's wife and mother as they step out of the Aiello residence. Aiello mausoleum at Riverside Cemetary, New York. Many cars with mourners and police on motorcycles who started the trip from his Lunt avenue home evetually disappeared upon arriving at Mt. Carmel. 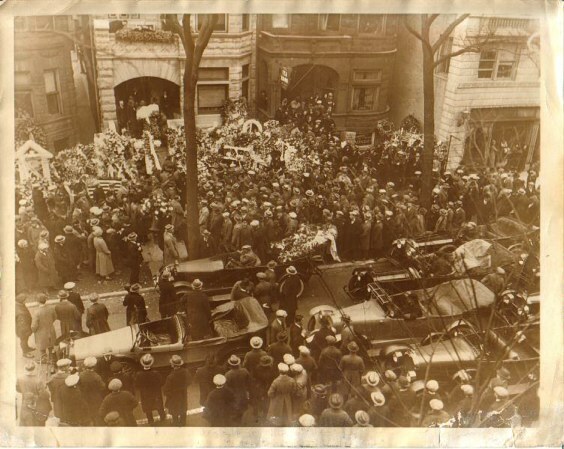 Besides the hearse all that was left was a a car containing Aiello's widow Catherine and three sedans containing flowers. Aiello's body was placed in a $11,800 bronze coffin with floral pieces amounting to $15,000. Undertaker's assistant George Gallagher recited the Lord's prayer at graveside. His body is later removed from Mt. Carmel and shipped to New York to be placed in a family mausoleum. Many thanks to the Aiello, Lombardo and Lolordo relatives for sharing info and supplying some of the photos shown here. Some photos taken from my original Al Capone on the Spot to explain the people and the story.